No definitive data are available regarding the value of switching to an alternative TNF antagonist in rheumatoid arthritis patients who fail to respond to the first one. The aim of this study was to evaluate treatment response in a clinical setting based on HAQ improvement and EULAR response criteria in RA patients who were switched to a second or a third TNF antagonist due to failure with the first one. This was an observational, prospective study of a cohort of 417 RA patients treated with TNF antagonists in three university hospitals in Spain between January 1999 and December 2005. A database was created at the participating centres, with well-defined operational instructions. The main outcome variables were analyzed using parametric or non-parametric tests depending on the level of measurement and distribution of each variable. Mean (± SD) DAS-28 on starting the first, second and third TNF antagonist was 5.9 (± 2.0), 5.1 (± 1.5) and 6.1 (± 1.1). At the end of follow-up, it decreased to 3.3 (± 1.6; Δ = -2.6; p > 0.0001), 4.2 (± 1.5; Δ = -1.1; p = 0.0001) and 5.4 (± 1.7; Δ = -0.7; p = 0.06). For the first TNF antagonist, DAS-28-based EULAR response level was good in 42% and moderate in 33% of patients. The second TNF antagonist yielded a good response in 20% and no response in 53% of patients, while the third one yielded a good response in 28% and no response in 72%. Mean baseline HAQ on starting the first, second and third TNF antagonist was 1.61, 1.52 and 1.87, respectively. At the end of follow-up, it decreased to 1.12 (Δ = -0.49; p < 0.0001), 1.31 (Δ = -0.21, p = 0.004) and 1.75 (Δ = -0.12; p = 0.1), respectively. Sixty four percent of patients had a clinically important improvement in HAQ (defined as ≥ -0.22) with the first TNF antagonist and 46% with the second. A clinically significant effect size was seen in less than half of RA patients cycling to a second TNF antagonist. TNF antagonists as a group have similar efficacy in RA, although their effectiveness differs in other rheumatic diseases. Moreover, case series and nonrandomized, open-label observational studies in RA indicate that some patients may fail to respond to one TNF inhibitor but will respond to another. This is partially supported by data showing that TNF antagonists differ in their pharmacokinetics and mechanisms of action . Nevertheless, there are no definitive data regarding the value of switching between TNF antagonists. Another therapeutic option is to switch to a different class of biologic agent such as rituximab, tocilizumab or abatacept [4–6]. Relevant clinical data on the 417 patients (82% women) are presented in table 1. The mean age of patients starting their first TNF antagonist was 53 ± 13 years, and mean disease duration was 10.4 ± 8.2 years. Sixty-eight percent were RF positive and 74% presented erosions. Three hundred ninety-six patients (94%) received concomitant DMARD; 324 methotrexate (MTX), 33 leflunomide (LF) and 21 antimalarials. During follow up, 263 patients (63%) continued the first TNF antagonist, 83 (20%) switched to a second, and 18 (4%) to a third. Seventeen percent of patients received no other biologic after discontinuation. Forty-six patients treated with a second TNF antagonist had switched from INF or ADA to ETA, 25 from INF to ADA and 12 from ETA to ADA. Among patients treated with a third TNF antagonist, 12 had changed from ETA to ADA, 5 from ADA to ETA, and 1 from ETA to INF. Mean DAS-28 on starting the first TNF antagonist was 5.9 ± 2.0 and decreased to 3.3 ± 1.6, at the end of follow-up. The improvement was statistically significant (Δ = -2.6; p > 0.0001) for the whole group as well as for the three TNF antagonists considered independently. DAS-28 on starting the second TNF antagonist was 5.1 ± 1.5 and decreased to 4.2 ± 1.5 at the end of follow-up (Δ = -1.1; p = 0.0001). DAS-28 on starting the third TNF antagonist was 6.1 ± 1.1 and decreased to 5.4 ± 1.7 at the end of follow-up (Δ = -0.7; p = 0.06). The results are shown in table 2. HAQ improved significantly (Table 2) with use of the first TNF antagonist, with a mean baseline score of 1.61 and final score of 1.12 (Δ = -0.49; p < 0.0001), with 64% of patients showing an improvement ≥ -0.22. Improvement was not significantly different with the three biologics. For the second TNF antagonist, mean initial and final HAQ were 1.52 and 1.31, respectively (Δ = -0.21, p < 0.004), with 46% of patients showing an improvement ≥ -0.22. For the third TNF antagonist, HAQ scores were 1.87 and 1.75 at the initial and final evaluation, respectively (Δ = -0.12; p = 0.1). The mean cumulative change in HAQ from pre-treatment with the first TNF antagonist is depicted in figure 1. Up to September 2008, there were 35 reports in the literature [7–42] on switching between TNF antagonists in RA patients who experience treatment failure. Twenty reports were based on observational studies, 10 on case series and 6 on prospective cohorts from biologic registries. Additionally there were 2 randomized clinical trials [8, 11]: 1 double-blind and 1 open-label study. The two clinical trials demonstrate the efficacy of switching between TNF antagonists. On the whole, the numerous design limitations of the other studies limit their value. Nevertheless, the vast majority of them report on the favourable efficacy of switching, yet information on the effect size is largely unreported. Most patients included in previous publications were women (83%, range: 60–100), with an average age of 52 years (range: 32–68), and a disease duration of 12 years (range: 3–27). When reported at baseline, mean DAS was 5.6 (range: 2.4–6.8), and mean HAQ 1.7 (range: 1.5–1.9). This baseline information is no different from what was found in our study. Of note, few publications report on DAS-28 effect size, DAS-based EULAR response and HAQ improvement in patients switching between TNF antagonists in comparison with patients who retain the first antagonist. A value of -0.22 in HAQ is considered the minimum clinically important difference (MCID) in studies of responsiveness . The size of improvement with the first TNF antagonist (-0.40) is within the range of what has been reported in clinical trials [44–46]. Two-thirds of patients treated with the first and less than half of those treated with the second TNF antagonist had a MCID in HAQ. Despite long-standing disease, HAQ improvement was parallel to DAS-28 improvement, a result that was unanticipated based on previous data . Three studies [14, 15, 20] have described retention rates of a second TNF antagonist as a surrogate for effectiveness. Overall, the probability of retaining a second TNF antagonist was lower than retaining the first one. The probability was influenced by the reason for drug replacement, i.e. drug failure or adverse event. Interestingly, the reasons for stopping a second drug were related to the reasons for stopping the first drug . Although the retention rate of a drug can be taken as a reasonable indicator of its effectiveness, parameters other than efficacy and safety, such as co-morbidity, co-medications, costs, availability of other therapies, patients' and physicians' expectations, and adherence to treatment could influence drug survival. In our study, retention rates of the second and third TNF antagonists were within the boundaries of what other authors have reported, suggesting that these rates are consistently found in clinical practice. 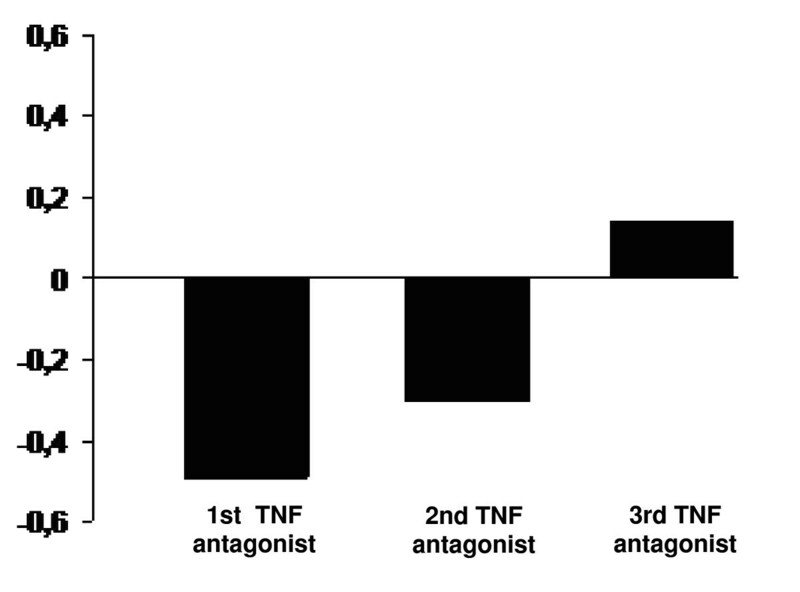 Herein, we show that lack of response to a first TNF antagonist does not predict the response to a second one, yet the efficacy of a second TNF antagonist is inferior to that of the first. The study was partially funded by a grant of BMS, Spain, and by RETICS Program, RD08/0075 (RIER) from the Instituto de Salud Carlos III (ISCIII), within the VI PN de I+D+I 2008–2011.